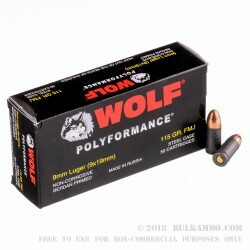 Pick up this 500 round case of 9mm Luger ammo from Wolf for a cheap, fun time at the range. 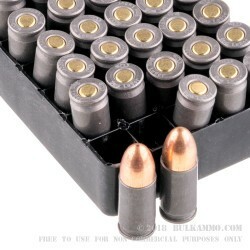 these cartridges come in boxes of 50 (with 10 boxes in each case) and fire a light 115 grain bimetal jacketed bullet. This is a standard pressure load that will work well with popular compact carry pistols. This ammo is loaded in Russia using non-corrosive Berdan primers and non-reloadable steel cases. The steel cases provide reliable cycling thanks to their polymer coatings and cost significantly less than brass cases. However, they do come with the downside of not being suitable for all indoor ranges because of their magnetic properties. I had several failure to feeds. 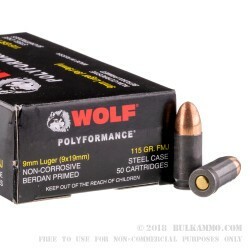 Great practice ammo for price. I had been considering some steel cased ammo, but had avoided it due to concerns about weapon damage. After watching a USCCA video that clearly stated that the steel case would not cause any damage, I decided to give it a try. I ran 150 rounds through my Glock 17 and 100 rounds through my Glock 19. No FTF or FTE. It is somewhat more dirty than higher priced rounds, but the lower price is worth it to me. I like to clean my guns anyway - I find it therapeutic! Great so far! Have not shot it though. Had a about 20 failure to fire's out of about 300 rounds I went through. I would buy again for range time for sure. Great deal. Glad I picked this up. Q: The gun range I shoot at forbids rounds with steel in the jacket. I see the case is steel, but where can I find out what the jacket is comprised of? Thanks for any help! A: Hello Ben, This ammunition is loaded with a bi-metal jacketed bullet. Unfortunately with the bimetal jacket, a magnet will attract that bullet due to the steel in the jacket.